Open the dialog Project - Manage - Project Items - Folders/Extensions. Click the button on the right side of Use ARM Compiler to open the dialog ARM Compiler Versions. The dialog shows the relative compiler installation path and the compiler version. Click Add another ARM Compiler Version to List. This opens a standard browser dialog. Navigate to the folder that contains the ARM compiler and click OK to register the compiler. The path to that folder and the ARM compiler version is shown in the screen above. With these steps you have registered an ARM compiler. You can remove a registered ARM compiler at any time. 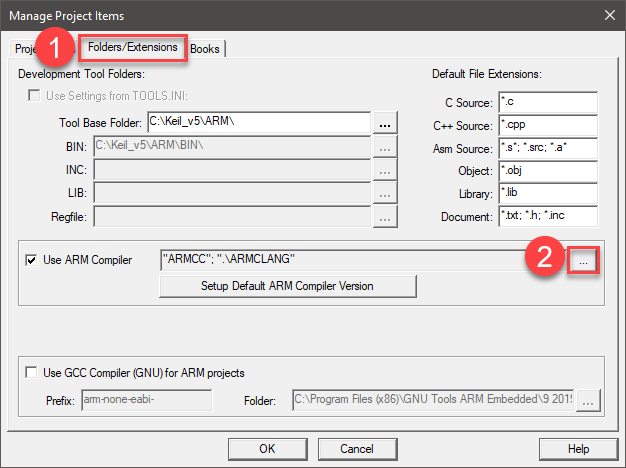 Select an entry in the dialog ARM Compiler Versions and click Remove selected ARM Compiler Version from List. No additional warning or approval dialog will be displayed. Only compilers registered with the steps above can be used within µVision. In addition, you can define a default compiler for each MCU type in the dialog Setup Default ARM Compiler Version. Later, during the development or maintenance phase of a project, you can configure a target to use a specific compiler version. This is done in the field Options for Target - Target - ARM Compiler. Compiler versions that have been deleted are identified with the entry Missing:. Also the Build Output window will inform about missing compiler versions. ARMCLANG: Error: No license checking back-end registered with id Keil.